Basically, the Special Order directed Maj. Gen. James Longstreet and Maj. Gen. D. H. Hill to continue from Federick to Hagerstown, Maryland. At the same time, three columns, cooperating under Maj. Gen. Thomas "Stonewall" Jackson, were to converge on Harpers Ferry from three different directions. The column directly under Jackson's command would swing north around Harpers Ferry, clear out any forces at Martinsburg and approach Harpers Ferry from the northwest. Maj. Gen. Lafayette McLaws's column, approaching from the Northeast, would occupy Maryland Heights which overlooks Harpers Ferry from the North side of the Potomac. Brig. Gen. John Walker, approaching from the East, would occupy Loudoun Heights across the Shenandoah River from Harpers Ferry. With the Confederate artillery on the mountains overlooking the town, the Harpers Ferry garrison could not stand. Lee assumed, from his judgement of Maj. Gen. George B. McClellan, that the Union general in charge of the Army of the Potomac, would be slow moving his army from Washington. If so, there would be enough time for Jackson to defeat the Harpers Ferry garrison and re-unite with Lee before the Union army approached. Two days after the Confederate army left Frederick, Maryland,(September 10, 1862) the Union army began arriving. Maj. Gen. McClellan arrived in Frederick the next day, September 13. On that day a copy of Lee's Special Order 191 was found by Union forces. It was being used as a wrapper for three cigars that apparently had been lost when Lee's forces began to move from the town. This discovery was quickly forwarded to Maj. Gen. McClellan. 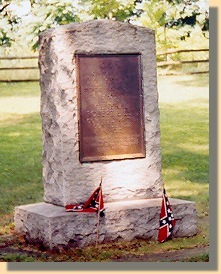 It provided him with the locations and time table of the split Confederate army moving to Hagerstown and Harpers Ferry. If McClellan moved quickly, he would be able to divide Lee's army and defeat it in detail. But McClellan did not move his forces until the next morning, September 14, 1862. Noting the approaching Union army, Lee was surprised how rapidly McClellan was moving. He ordered Longstreet, D.H.Hill, and part of McLaws forces at Harper's Ferry to defend the three gaps in South Mountain which separated the two armies. Although the gaps in South Mountain were lost in subsequent fighting, the delay of the Union army was sufficient to allow Lee to combine a majority of his forces at Sharpsburg. Because Harpers Ferry had just surrendered, the Confederate forces involved there were also returning to the army, except A.P.Hill's division, which remained behind in order to process the Union prisoners and ship the captured supplies. 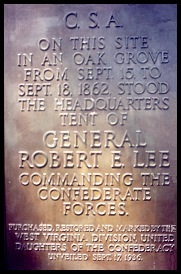 Location of Lee's Headquarters Tent at Sharpsburg. On September 16, both armies moved into positions around Sharpsburg and Antietam Creek. Shirmishing north of Sharpsburg that evening indicated to Lee where he could expect McClellan to attack the next day.